Major Hamza Al-Mustapha, the former Chief Security Officer to the late Head of State General Sani Abacha and Lateef Shofolahan were yesterday convicted by a Lagos High Court sitting at Igbosere over the murder of of Kudirat Abiola, the wife of the acclaimed winner of the June 12, 1993 Presidential election, Chief Moshood Abiola. The accused persons were sentenced to death by hanging. A four-count charge of “conspiracy and murder of Alhaja Abiola on June 4, 1996 along the Lagos/ Ibadan Expressway, Lagos toll gate, opposite Cargo Vision, Ikeja in Lagos”, was preferred against Al-Mustapha and Shofolahan when the state established a prima-facie case against them. The trial of Major Mustapha is adjudged to be the longest criminal trials ever experienced in the nation’s history, lasting more than 12 years with five successive judges. This time in prison calendar is equivalent to 20 years. Al-Mustapha and Shofolahan have been standing a joint trial after the third accused person – CSP Rabo Lawal, the Officer in charge of Mobile Police (OC MOPOL) then at the Aso Rock Villa was discharge and acquitted by the Court. Specifically, Shofolahan is alleged to have provided the details of the movement of the late Kudirat Abiola at the time of her murder. The prosecution led by Lawal Pedro had accused Al-Mustapha of ordering Sergeant Barnabas Jabila (Sgt. Rogers), who was then a member of both the Strike Force and Body Guards – military units within the Aso Rock Presidential Villa in Abuja, to kill Mrs Abiola. The wife of the eminent Businessman and politician was shot dead on June 4, 1996 along the Lagos/ Ibadan Expressway, Lagos toll gate, opposite Cargo Vision, Ikeja in Lagos. The prosecution also accused Mr Shofolahan, who was said to be Kudirat’s protocol officer, to have revealed the deceased’s itinerary to her assailants. According to the prosecution, Mohammed Abdulof was alleged to have driven the car Jabila that Shofolahan used to trail and killed Mrs Abiola. Mr Shofolahan, however, denied that he ever worked for Kudirat in any capacity throughout her lifetime. The prosecuting lawyers in their 34-page final written address, at the close of the trial on November 10, 2011, urged the court to convict the two accused persons as charged. However, Al-Mustapha’s lawyer, Olalekan Ojo, in his 112-page written address, said the prosecution’s evidence was not supported by law. He urged the court to acquit and discharge his clients. Meanwhile, THE daughter of the late Alhaja Kudirat Abiola, Mrs Hafsat Abiola-Costello, has said the death sentence passed on al-Mustapha and Shofolahan would give her late mother a sigh of relief in the grave, after 16 years of waiting. She said this while reacting to the judgment in Abeokuta, Ogun State, where she described the judgment as victory for Nigerians. 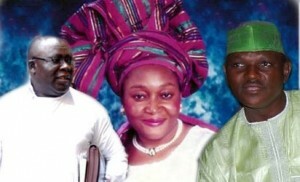 Abiola-Costello said though the judgment was delayed, it was not denied. “My mother can have relief. I want to say that we are grateful to the judiciary for the judgment. Though we can say it is delayed, but it is never denied. I am relieved myself, because we almost lost faith in the judiciary, but, today we have a victory for Nigerians,” she said. Abiola-Costello, a Special Assistant to Governor Ibikunle Amosun of Ogun State on Millennium Development Goals (MDGs), described Shofolahan as an opportunist, who came into the family under the pretext of giving her mother political support.